Talking about wrong man in the wrong place at the wrong time. "As Colonel commanding the 10th Regiment of Bersaglieri from 1892 Cadorna acquired a reputation for strict discipline and harsh punishment." "He wrote a manual of infantry tactics which laid stress on the doctrine of the offensive." After he was dismissed the Italians began to understand that you cannot run an army by fear. More is needed to motivate the soldiers. And if you are only interested in offensives at least you should have the sense to prepare them properly and to have mobile reserves, don't you think? Cadorna did not think so and it shows in his horrendous military record. The responsibility of the catastrophe lies with the Italian government that chose this man July 1914 to be the commander of the entire Italian army. Cadorna was already near retirement age and should have been allowed to step aside. Instead, the fate of the nation was given in to his inept hand at the dawn of the worst war humanity had ever seen with disastrous consequences to Italy. "Cadorna fielded thirty-six infantry divisions composed of 875,000 men, but with only 120 modern artillery pieces." Well, even without artillery these young Italian men certainly looked handsome and impressive while marching past the highly decorated Field Marshal in a military parade. Few realized in 1914 that these people, 300.000 of them, were soon to be literally cannon fodder. The survivors of the last battle would be so deadly afraid of their highest commander that they eagerly surrendered to the Central Powers whenever opportunity allowed, 275.000 men. Field Marshal Luigi Cadorna wasted the life of over 300.000 Italia's best on useless and ill-deceived military campaigns to occupy Slovenia and lost 275.000 men as prisoners of war trying to do that. Over half a million Italian people. Plus all those Slovenian casualties and others. The government finally came to its senses and fired this man from the position of the country's highest ranking commander - but that was way too late. The world was in fire and why not to take advantage of this and enlarge the territory of Italy a bit? The Isonzo river seemed like a gateway through the mountains to the Slovenian plains and also to taken the historical town of Trieste to Italian rule. He had enough men for the expedition didn't he? So Field Marshal Luigi Cadorna launched with the support of his government his beloved infantry offensives against Austro-Hungarian defensive lines, Four of them in 1915. Avanti popolo! Cadorna was at best a mediocre soldier. Any general would have realized that going from the plains of Northern Italy up to the Julian Alps and other mountain ridges would not be wise without extensive artillery support and careful planning. Even so it would be risky business because of the terrain favoring the defenders. But not so Cardono - attack! All four offensives ended in total failures with the loss of 275.000 Italian soldiers. So what! La vittoria sarà nostra, victory will be ours. Those officers who opposed his madness were dismissed from their positions, 217 in all. Soldiers who escaped from their posts were summarily executed, 750 by orders of military courts - "the highest number in any army during Word War I". Even the ancient practice of decimating military units, killing randomly picked officers and soldiers from a unit that failed in its task, was used under his personal command. Germans are military geniuses as Emperor Julius Caesar already had learned to his dismay. They gave the Austro-Hungarians troops helping hand against Italy at Isonzo river plain on October 24 1917. The German attack was planned by young Erich Rommel and Italians simply had no chance at all. The entire Second Army fled in total disarray. The catastrophe of the Battle of Caporetto has not been forgoteen and is today a proverbial term for utter disaster in Italian language. 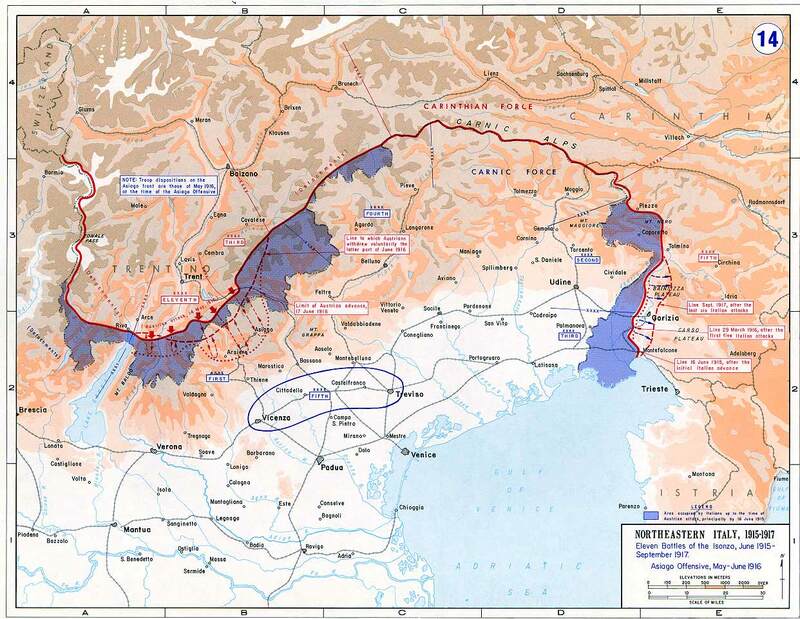 Luigi Cadorna's intention to attach Slovenia into Italia eventually came to realization with the help of Allied forces, Britain and France and the victors at Versaille's did this crime against the nations also. Italian rule over Slovenia did not last for long, however, and seems today an utterly stupid idea even without considering the price in human blood and suffering. Austro-Hungarian army forced Slovanian men to the battle against Italy while the civilians living under Italian occupied areas were sent to prison camps and treated as enemies. Well. The son of Field Marshall Luigi Cadorna, General Raffaele Cadorna (1889 - 1973) was a genuine war hero, fearless fighter and partisan, leader of Italian resistance against the Nazis. Highly decorated soldier who to his credit had the sense to resign after disagreement with the post-WW 2 political establishment.